Pujya Swami Chidanand Saraswatiji, President of Parmarth Niketan (Rishikesh) and Co-Founder of Global Interfaith WASH Alliance, and Sadhvi Bhagawati Saraswatiji, Secretary-General of the Global Interfaith WASH Alliance, inaugurated the “Loo with a View” today at the ‪#‎Ujjain‬ Simhasth Kumbh Mahaparv – 2016. It is an enclosed ‪#‎toilet‬ stall where the door is a one-way mirror door through which the person on the outside sees a mirror on the door but on the inside, the person using the toilet can look at the outside world. This gives a sense of what it’s like to defecate in an open space which appeals to many men who enjoy the freedom of defecating in the open. Additionally the creative and innovative toilet concept exposes the embarrassment felt by so many women and girls in this nation when they have no choice but to defecate in the open. In this way, the lack of safe and private toilets was profoundly and intelligently displayed by WaterAid India in association with the Ujjain Municipal Corporation. The message of ‘‪#‎SwachhSimhastha‬, ‪#‎SwasthHum‬’ echoed in the hearts of thousands of pilgrims visiting the mela at this event focused on ‪#‎WASH‬ (water, sanitation and hygiene) organised by the partnership of Global Interfaith WASH Alliance, WaterAid India, Simhastha Kumbh Mela authority and Bhartiya Grameen Mahila Sangh. 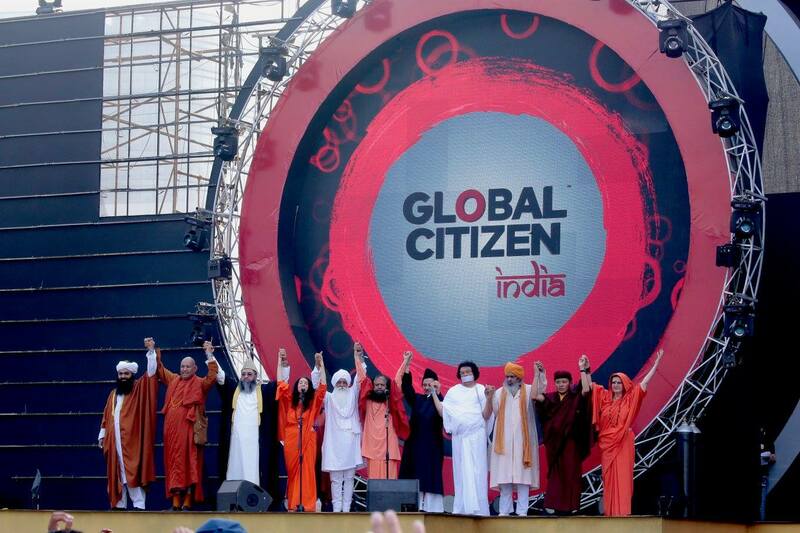 Pujya Swamiji led the pledge of making India ‪#‎OpenDefecationFree‬. He said, Nearly 600 million, or half of India’s population defecate in the open, resulting in our precious water sources getting contaminated by sewage waste, which leads to 1200-1600 deaths of children under the age of 5 every day. The inauguration was to support the initiative to make Simhastha Kumbha Mela and India completely open defecation free.